We gathered in the sanctuary about a week ago on a Tuesday afternoon in order to put together the Chrismon trees and to hang wreaths outside the church. Members of the Flower Committee and of the congregation gathered to decorate for Advent and Christmas, adorning the sanctuary with signs of the season. The nativity scene was carefully placed in the vestibule, and greenery was hung in the balcony and choir loft. The hands of the church were busy decorating our sanctuary, where we would celebrate the birth of Jesus. They decorated the sanctuary, so it would invite us to remember. It was one of those behind-the-scene moments of congregational care and preparation. It was setting the stage for singing the carols of this season and sharing the light of Christ on Christmas Eve, as we hold up candles together in the dusk of the evening. It was indicative of the beauty of this season, as congregations worship, families gather to eat, people serve others, and voices sing about the love of God. On the First Sunday in Advent, we sang, “Christians all, your Lord is coming, drawing near in holy birth. Ring the bells and sound the trumpets, let your music fill the earth.” The decorations of the sanctuary help us fill the earth with our music, as we anticipate the coming of Christ into the world. 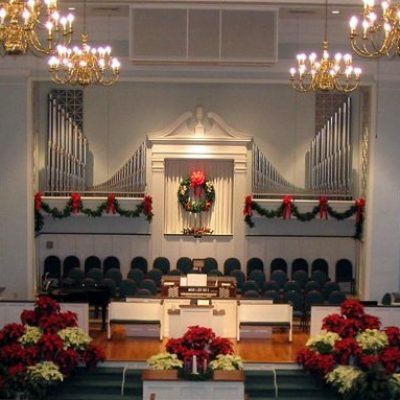 The hands of the church set the stage for our singing during this time of year, but also throughout the year. In many behind-the-scene actions of congregational care and preparation, the stage is set for us to gather and to remember the love of God. It happens not only in the sanctuary, but also throughout the church, where people create space for community and grace. Every time we worship, we give thanks for the many hands of the church. As we depart from worship, we carry with us the community and grace we have received. We enlarge the circle of our lives by taking the love of God with us. We share it with others in many behind-the-scenes moments. We take the church with us, where it is needed, for the beauty we witness in worship is needed by the world.